People who appreciate Guy Clark often point to the craftsmanship of his songwriting; his homespun, easygoing guitar playing; his stark, cut-to-the-chase lyricism. And that’s understandable. But if you want to comprehend the full depth of his artistry go ahead and let some of his songs begin to mean something to you. Let them get under your skin. Let them prey on your mind a while until you recognize some fundamental part of yourself in between their lines. Because a good song transcends the means and mechanics of its construction to speak to some sort of universal truth—and Guy Clark knows how to write a damn good song. 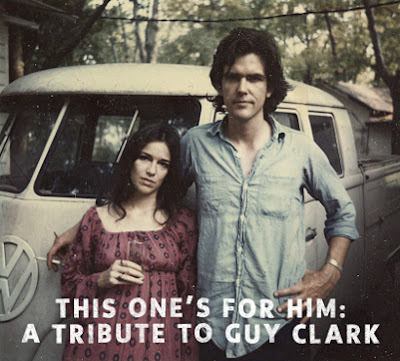 This is what has made him an influence on mentors and protégés alike for the past four decades, a distinction illustrated by a new compilation, This One's For Him: A Tribute to Guy Clark (Icehouse Music). Released on the occasion of his recent 70th birthday, the double-disc set features inspired renditions of some of the troubadour’s finest works by the likes of Willie Nelson (“Desperadoes Waiting For A Train”), Patty Griffin (“The Cape”), and Jack Ingram (“Stuff That Works”), to name just a few. Some moments are more compelling than others, like Vince Gill's poignant reading of “The Randall Knife,” and an achingly tender version of “Magnolia Wind” from Emmylou Harris and John Prine, but all of them are consistently heartfelt and make for a wonderful tribute to one of music’s most singular songwriters and storytellers.